The Xinglong Mountain Tourism Resort is scheduled to open to the public on September 16, 2017. The 38-square-kilometer mountainous destination, located in Xinglong County, Chengde, China, is home to a nature reserve that encompasses 14.7 square kilometers. The resort was conceived and designed according to the standards of China’s 5A-Class rating, the highest designation as per the China National Tourism Administration’s tourist attraction ratings categories. The major developments in the first phase include the Baimachuan eco-parking lot, a tourist transfer center, a cliff walk, suspended restaurants, vertical panoramic elevators, escalators, a glass bridge, a water landscape, Grade-A restroom facilities, meaningful explanatory signage, as well as smart tourism destination systems and equipment. Xinglong County is home to a complete natural ecosystem, which is commonly referred to as “a natural species gene pool” by members of the scientific community. The county is also the area with the best air quality, the most abundant negative oxygen ion content and the highest forest coverage in the Beijing rim region. The high forest coverage means the area is one that, in northern China, does the best job of scrubbing the air clean of pollutants. Since 2014, the county has been listed among the “Top 100 Small Cities in China for Deep Breath” for four consecutive years. For those who want to escape the country’s many polluted urban areas, Xinglong Mountain, with its clouds and streams, is an ideal place to breathe in some fresh air. Xinglong Mountain is a national geopark, and the Xinglong Mountain Tourism Resort is one of the four key scenic spots within the geopark. Xinglong Mountain is at the eastern end of Yanshan Mountains. It is precipitous, with the base of the mountain highest on its northwest side and lowest to the southeast. The mountain was formed during the Yanshan Movement, the prehistoric period during which the region surrounding Beijing assumed its current contour. The Henghe canyon, formed through thousands years of erosion, runs north-south through Xinglong Mountain. The transformation of the region as a result of the Yanshan Movement is what gave Xinglong Mountainits complicated geologic configuration. Following a strict interpretation of what feng shui, the Chinese philosophical system for creating harmony with the surrounding environment, dictated for the region, most of Xinglong county was designated as a forbidden area for 254 years by China’s ancient royal families, allowing the area to become a home to dense forests, a wide variety of wild animals and a host of springs. Strict regulations and security during those times protected the area’s ecosystem, transforming it into a natural wildlife garden. Once the ban was lifted, merchants from Beijing and Tianjin rushed to establish logging operations, farms and shops. Thronged with numerous merchants, these mountainous areas enjoyed business prosperity (pronounced “xing long” in Chinese). It is for this reason that the region adopted the name Xinglong Mountain. 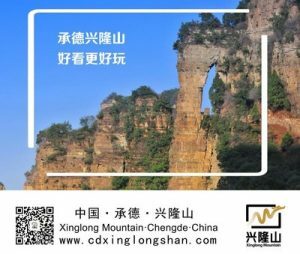 With the fortuitous opportunity to remain an enclosed complete natural ecosystem complimented by the excellent climatic conditions of the region for more than a quarter millennium, Xinglong Mountain Tourism Resort is now a perfect destination for leisure, sightseeing and ecotourism.